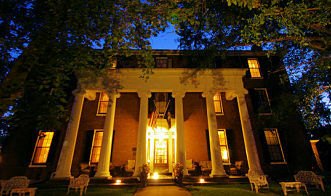 Located in historic Harrodsburg, in the heart of the Bluegrass region near Lexington, the Beaumont Inn is Kentucky's oldest family-run bed and breakfast inn. Recipient of numerous awards, the inn features beautifully appointed rooms across three historic buildings, traditional Kentucky cuisine (including fried chicken and cornmeal batter cakes!) and a spa. Local attractions include horse farms, bourbon distilleries and a variety of historic sites. This elegant and romantic inn is located less than 10 minutes from the beautiful scenic Ohio River and Otter Creek Park, and is close to the Squire Boone Caverns and Indiana Caverns. Each unique guest room is luxuriously furnished and offers a private bath, flat screen TV, complimentary NETFLIX movies and Wi-Fi, a desk, superior goose down feather beds and luxury linens.